00:40:00 Makes 6 servings, 1 parfait each. Makes 6 servings, 1 parfait each. 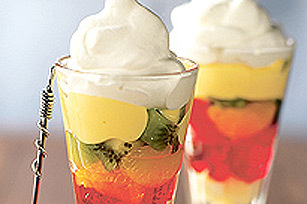 These Fruity Trifle Parfaits are individual servings of layered angel food cake, jelly, vanilla pudding, fresh fruit and creamy whipped topping. When you are looking for a fast and fresh no-bake dessert, you can count on this recipe to be a hit. Add boiling water to dry jelly powder; stir until completely dissolved. Add ice cubes; stir until jelly is slightly thickened. Remove any unmelted ice. Refrigerate 10 min. Meanwhile, prepare pudding as directed on package. Divide cake cubes evenly among 6 parfait glasses or dessert cups; cover with layers of the partially set jelly, pudding, kiwi and oranges. Top each with 2 Tbsp. of the whipped topping. Refrigerate at least 15 min. before serving. Store leftover parfaits in refrigerator. Substitute 2 cups chopped drained fruit in a jar for the kiwi and mandarin oranges. This tasty dessert is an excellent source of vitamin C.
Serving Size Makes 6 servings, 1 parfait each.